If you are planning on remodeling your kitchen and you are going to install "stock" kitchen cabinets. It is important to know the standard sizes of wall and pantry kitchen cabinets that are normally available from most manufactures. Note: Stock wall and pantry kitchen cabinets are cabinets that have been built prior to order. 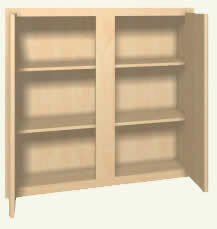 Custom kitchen cabinets are built to order and can be manufactured to any size. Why is it important to know the standard stock sizes of wall and pantry kitchen cabinets? When you do your kitchen remodel design and are using stock wall and pantry kitchen cabinets, you must design the cabinet layout so that you can fit standard stock size cabinets in the allocated spaces. Note: Not all manufactures make all the sizes of wall and pantry cabinets and some manufactures may have additional sizes that are not listed. Always check with the manufacture to ensure that the size you require is listed as one of the items in their standard stock wall and pantry cabinet size list.